The DSP-1L or DSP-1LM is used to protect your three-phase motors against loss, imbalance or inversion. It continuously monitors each phase of your power supply. In case of phase loss, imbalance or inversion, the DSP-1L cuts off the power to the control circuit and thus protects the motor concerned. The DSP-1LM is used to transmit a signal to a PLC. As soon as the three-phase power supply returns to normal, the DSP-1L enables the engine to restart normally and safely. However, the DSP-1LM’s Optomosfet contact will trip again. you know about the DSP-1L and DSP-1LM detectors, you know how to protect the production of your business against phase failures. Fully calibrated in our laboratories, the DSP-1L phase imbalance detector is also easy to install and ready for operation. DSP-1L is delivered “ready-to-install”; all calibrations have been performed with precision during manufacture. 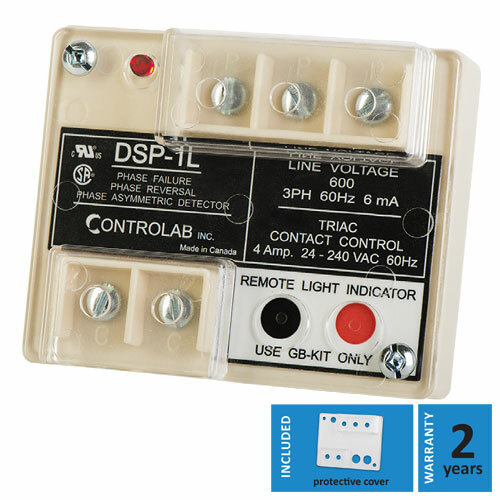 The DSP-1L is also adjusted to avoid false alarms. No need for auxiliary power, no rails, no plug-in modules to install. Due to its small size, it can be installed inside most control boxes. The contact of the DSP or DSP-1L-1LM is normally open. Once the phases are connected and no faults are detected, it closes after 2 or 3 seconds. It will open again as soon as a failure is detected. The detector’s epoxy coating provides very good protection against moisture, corrosion, dust and vibrations. No adjustment is required because our electronic circuit calibrated between 8% and 9% imbalance is completely sealed. The DSP-1L or DSP-1LM samples the voltage and not the current. It can therefore be installed on a 1 or 2,000 HP engine. Also, our DSP-1L or DSP-1LM, in addition to being resistant to normal voltage fluctuations, is also equipped with a visual alarm indicator (LED). For specific situations, a remote indicator light (GB-Kit Option) can be installed on the front of the control panel. The GB-Kit lights up regardless of the phase that is missing because it is not powered by the control transformer. 1- Can you connect a DSP-1L or DSP-1LM to single-phase or two-phase voltage? No, because the DSP-1L or DSP-1LM works only with three-phase voltage. 2- To which three-phase voltages can a DSP-1L or DSP-1LM be connected? All three-phase voltages between 208 volts and 600 volts (do not forget to specify the desired voltage when ordering). 3- Can a DSP-1L or DSP-1LM still be connected to a voltage of 1200 volts or more? Yes, with the use of a PT (Potential Transformer) because what is occurring on the primary side of the transformer is the same as the secondary side. So if there is a loss, an inversion, or a phase imbalance at the transformer input, it will be automatically analyzed by the DSP-1L or DSP-1LM at the output of these transformers. 4- What are the switch-on and switch-off times of the DSP-1L or DSP-1LM? The delay is between 2 and 3 seconds, both for switching on and off. 5- The DSP-1L or DSP-1LM is adjusted to have an imbalance between 8 and 9% because, during a phase loss, there is a regeneration that reach up to 90% of the nominal voltage on the missing phase. This results in very rapid heating of the engine, which will eventually burn out. Our detector is adjusted to an imbalance between 8 and 9% for maximum protection. 6- The DSP-1L or DSP-1LM works on voltage and not current, so it can be installed on engines with 1 hp or 2000 hp and more. 7- The GB-KIT or the LED light on the DSP-1L or DSP-1LM turns on to indicate a phase loss, phase inversion, phase imbalance or internal malfunction in the device. 8- The GB-Kit or the LED light on the DSP-1L or DSP-1LM turns on regardless of the missing phase because it is not powered by the control transformer, but by the internal power supply of the detector. 9- If GB-KIT oscillates, there may be two reasons. a) An imbalance between phases that is close to the tripping threshold of the unit. b) A change in the values of the internal components that affects the sensitivity calibration, making it increasingly sensitive (So instead of 8 to 9%, it will trend towards zero). 10- Even if the LED light or GB-KIT oscillates, the DSP-1L or DSP-1LM contact will not oscillate. When the oscillation reaches a certain speed, the contact will open to interrupt the starter circuit. 11- The DSP-1L triac contact has a capacity between 24 VAC / 240 VAC, with a 4.0 amp maximum. The triac contact can only operate with an AC supply, and not DC. 12- The DSP-1LM OptoMosfet contact has a capacity of 30 VDC / 120 VAC, with 120 milliamps. The maximum contact resistance of the OptoMosfet is 35 ohms. 13- How can the DSP-1L triac contact be tested? a) Never test the triac contact with an ohmmeter because it will always produce a resistance value, whether it is open or closed. b) With the diode tester, the triac contact can be tested. c) By placing a light in series with the triac contact. d) Normally, if the LED light or GB-Kit on the DSP-1L or DSP-1LM is turned on, the contact is open and if the LED light is off, the contact is closed and functional.